Click this link to read Terms and Conditions. You’ll receive your login via email. Your license is available the next business day. Please call for expediting. Weekend/Holiday service: Orders placed on the weekend/holiday will be delayed by one business day. 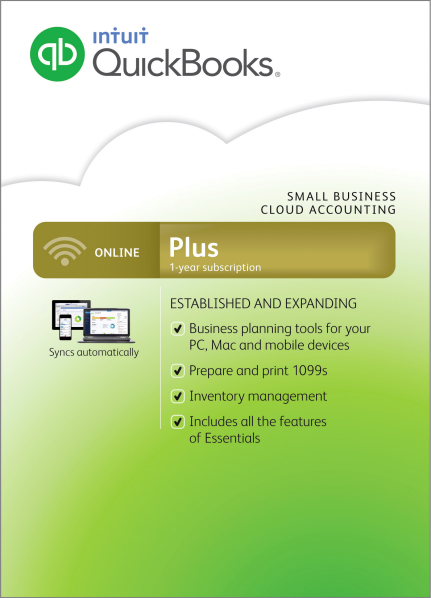 QuickBooks Online Plus: Prepay 12-months and save 60%. QuickBooks Online Plus: Choose the annual plan and save! This is our lowest price Plus product. Prepay 12-months and save! The Annual Plan is limited to 5-users. Need more users? Click here. Work from anywhere with an Internet connection. Bring your own device. Smart Phones, Laptops, Macs, and PC’s give you many options to access your data. Move to the Cloud…..never install a software update again! That’s right. As new features are added to your software, they become automatically available to you the next time you login. This allows you to focus on your business and gets you out of the IT business. Connect QuickBooks Online Plus to your Bank and Credit Card accounts. This will speed up your reconciliations and improve the accuracy of your books.